Gel nail polish is a new trend in nail fashion that offers a durable, pretty nail finish. 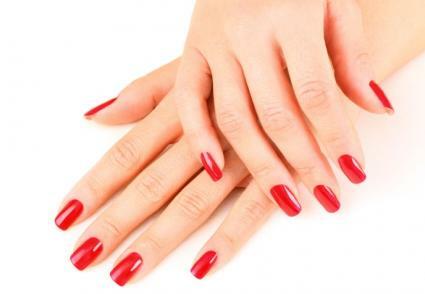 Although it's more expensive that traditional polish, many women like the benefits of this type of nail color. You can get this type of polish done in a salon, or try it at home if you have the proper supplies. Gel nail polish has some benefits that standard nail polishes, even chip-resistant and fast-drying formulas, just don't have. Quick drying: Gel polishes dry within a few minutes because of the use of the "curing" light. This quick drying feature is perfect for putting on closed-toe shoes after a pedicure. These lights are perfect for hardening gel polish without burning your skin. Traditional nail polishes and gel polishes part ways when it comes to application. Gel polish goes on with a special brush and is removed by soaking the nails. After each layer of polish, including the base coat, it is cured with a UV lamp. In order to do gel nails, you will need to purchase a gel nail starter kit. Here are a few companies that sell these kits. Pure Spa Direct: The CND Shellac Maxi Complete Starter Kit with UV Lamp can be purchased here by licensed professionals. (It's also available in salon supply stores) . The kit includes an entire set of Shellac colors and other supplies and accessories for under $500. Couture Gel Polish: Purchase this kit that includes three polish colors, base and top coat, and UV lamp for $129.00. SensatioNail: A more affordable starter system, this kit is available at Drugstore.com for under $60 and includes gel cleanser, primer, polish, UV light, and a few accessories. Easy on, easy off is truly the motto for gel nail polish. Follow these instructions to quickly and easily remove gel nail polish. Wrap the area around the nail with the soaked wrap. Allow wrap to sit on the fingers for approximately 10 to 12 minutes. Slide the wrap off, removing the gel polish. Note: For any spots the wrap missed, soak a cotton ball in acetone, hold on the affected areas for a few seconds, and gently wipe the color away. There are several brands of gel-based polishes available. CND Shellac is the first nail color of this type, created to color the nails as easily as polish, but with the durability and long wear of a gel. This innovative brand is available in a dozen easy-to-wear, versatile colors. Nail artists can also create custom colors by layering different Shellac hues. Bio Sculpture offers a line of colored gel paints, which come in mini tubs or pots. You can airbrush over these gels with water-based paints. Remove them quickly by soaking in gel remover about 10 to 15 minutes. Visit Bio Sculpture's website for more information about their product. CalGel offers a complete nail system from gel colors to UV lights. There are over 80 gel colors that apply well over natural and artificial nails. The products are easy to remove and resist chipping and flaking. Change CalGel's nail colors by painting right over your current top coat. CalGel offers online training to anyone who wants to learn how to apply their products. Ever popular OPI received the "Breakthrough Award" from Allure magazine for their Axxium Soak Off Lacquer. Colors like Big Red Apple are bold and bright, making this color perfect for getting attention. Visit OPI's website or ask your local professional about purchasing OPI gel nail products. Have the nails or polish removed if you have adverse side effects. Whether you choose to do your gel nail treatment at home or at a nail salon is strictly a matter of personal preference. Applying the polish is easy using nail starter kits but you may not have the time or desire to try it. If you prefer to get a manicure from a nail salon instead of purchasing a kit, be sure to call ahead to confirm they have the tools and supplies available to do this unique and innovative nail manicure.